While our goal is, of course, to keep your natural teeth healthy (and in your mouth!) for as long as possible, there are many cases in which having a tooth extracted is in your best interest. Maybe your tooth has become so badly decayed, broken, or infected that it’s past the point of saving. Maybe your teeth are too crowded or you have an impacted wisdom tooth. Whatever the reason, rest assured you’re in great care at Modern Smile Center. 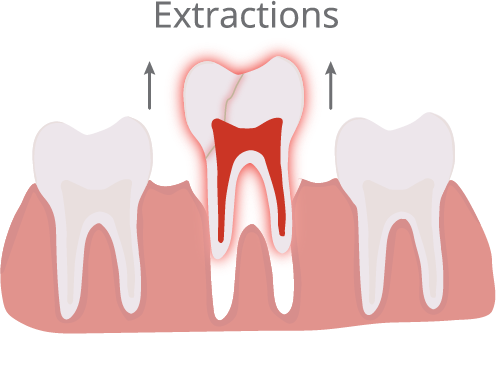 Extractions can be performed under local or general anesthetic, depending on your needs and preferences. Either way, we will make sure you fully understand the details of the procedure and ensure you are comfortable and don’t feel a thing. We will give you detailed post-op instructions to follow to ensure the fastest, most comfortable recovery for you. To get the gentle, compassionate care you deserve.